Jaw Width - 1/2 in. Tip Width - 9/32 in. Overall Length - 6-5/32 in. The Proto J223G 6-5/32 in. 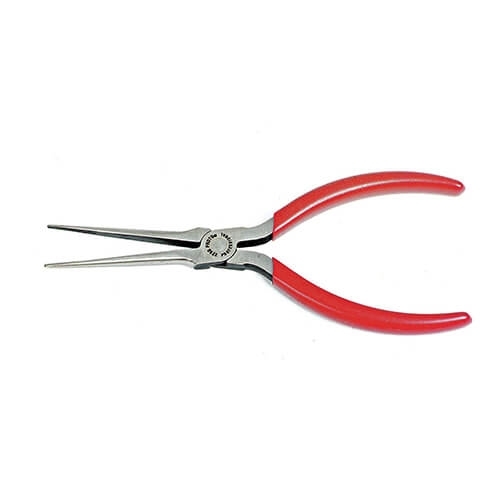 Needle Nose Pliers feature long, slender jaws that work well in confined spaces. Their pointed tips get into small areas with ease. The inside surface of the jaws may be smooth or serrated depending on the model. The smooth surface may help avoid marring or scratching, while the serrated surface helps provide a firmer grip. Suitable for gripping, bending, and cutting small-gauge wireas well as precision work such as electronics or jewelry.